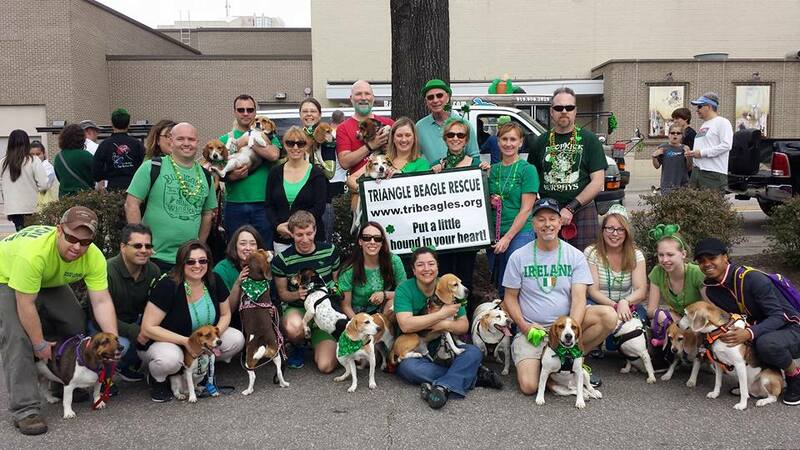 Find a forever friend at Triangle Beagle Rescue, or any of the area rescues where deserving dogs await loving homes. the character of Snoopy for his wildly popular cartoons, there was a reason Snoopy was a beagle. According to the American Kennel Club, beagles are not only excellent hunting dogs and loyal companions, they’re also smart, friendly, and cute. Beagles have a long history as working dogs originally bred to hunt hare. They have 220 million scent receptors, compared to about 5 million in a typical human. Queen Elizabeth I had a beagle so small it would fit into her pocket. Lyndon B. Johnson had three beagles, named Him, Her, and Edgar. So if you choose a beagle for your own family pet, you’ll be in excellent historical company—and there’s just the local rescue to help make this hound dream happen. Tenbusch says the biggest need is for people willing to foster a dog, an important part of TBR’s life-saving team since the rescue doesn’t maintain a shelter; instead they must depend on foster homes where the beagles can stay while awaiting adoption by a forever family. The beagles typically stay in a foster home for a couple of weeks up to a couple of months, depending on the amount of work the dog needs. If you are thinking of adopting a puppy, check out the Puppy Guidelines on the TBR website, TriBeagles.org. The puppy will be microchipped and given its first round of shots. Subsequent shots (including a rabies vaccine) and medical care are the responsibility of the new owners. However, the rescue will reimburse $50 of the cost of a spay or neuter procedure. In order to adopt a beagle permanently, the process begins with a phone interview and a visit to your home by another volunteer. Puppy adoptions differ from adult dog adoptions in that trial adoptions are not allowed for puppies. The full $350 adoption fee is due and the final contract must be completed upon delivery of the puppy. However, any beagle that has ever been adopted from TBR remains a TBR dog for life. If an adopted family can no longer care for the beagle, they are always welcome back to the rescue. 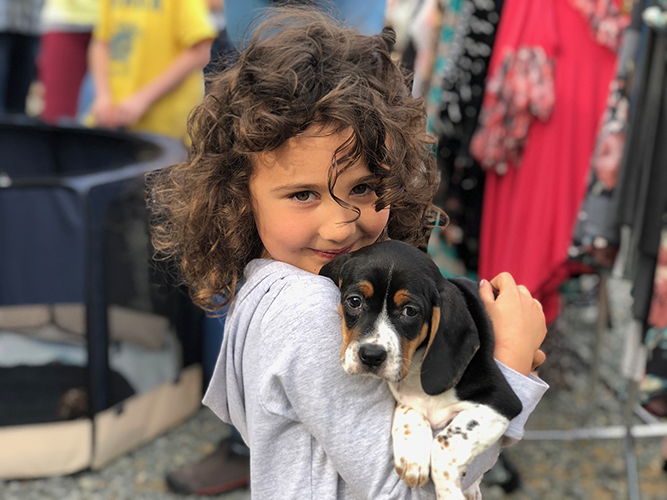 If you aren’t ready to commit to fostering or adopting, but are interested in finding out more about parenting a beagle, you might enjoy coming to one of the rescue’s Adopt-a-Thons. One is scheduled for October 13th, from 11AM to 1PM at the Petco in Raleigh, at 7811 Alexander Promenade Place. TBR always welcomes monetary donations to help pay vet bills. You can become a Beagle Backer, with an ongoing monthly donation, or choose to participate in the “Name a Dog” program, which—with a one-time donation of $25 or more—allows you to choose a name for a rescue dog. And if you’re looking for a fun event to lend your support, plan to attend Beaglefest on October 20th at 1PM. This is TBR’s big fall fundraiser, and it will be held at the Sunny Acres Pet Resort at 5908 Hillsborough Road in Durham. Tickets are available online at TriBeagles.org and on the TBR Facebook page. Dogs get in free! Beautiful photos and personal histories of the precious “Beags” awaiting foster or forever homes can be viewed at TriBeagles.org, and you will also find all of the necessary foster agreements, applications, and easy opportunities to make a donation on the website.